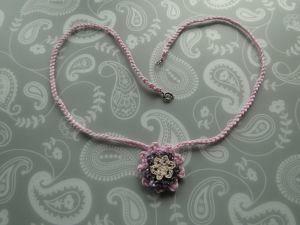 This pretty necklace would make a fantastic gift for a little girl! Or you can make one for yourself, if you're young at heart - which I'm sure we all are! Something to hold the necklace together. I used a "trigger catch" and a ring. If you're making a longer necklace that will go over your head, you can just tie the two ends together. Using the same yarn as the biggest flower (the one at the back) and the smallest hook you can work with, make a neat chain as long as desired. Make sure you leave a few inches/cm tail at the beginning and end of your chain so that you have enough yarn to sew on your catches/clasps. You may be making a longer necklace that can go straight over your head, in which case you may decide to just tie it together. My chain is 17 inches (44 cm) long. This is the shortest necklace I personally would wear. 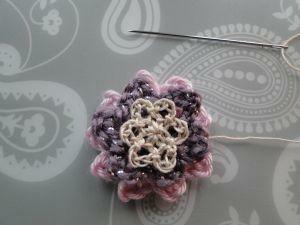 Once you've fastened off your chain, thread it from back to front through one of the petals of the biggest flower. Then thread it from front to back through the next petal. 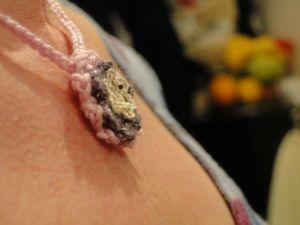 Next, either tie the chain together, or sew your catch/clasp/ring onto the ends.